Magnet mode not working on lan server (i'm OP). mod is bugged. why if i in planet chooser(advanced rocketry) interface, buttons not hiden!!! When i click the mod button somehow scrolling does not work right. It only reacts sometimes.Anybody else got that problem? Thanks. such a small but useful mod! Where can I find this mod for minecraft 1.8.9? 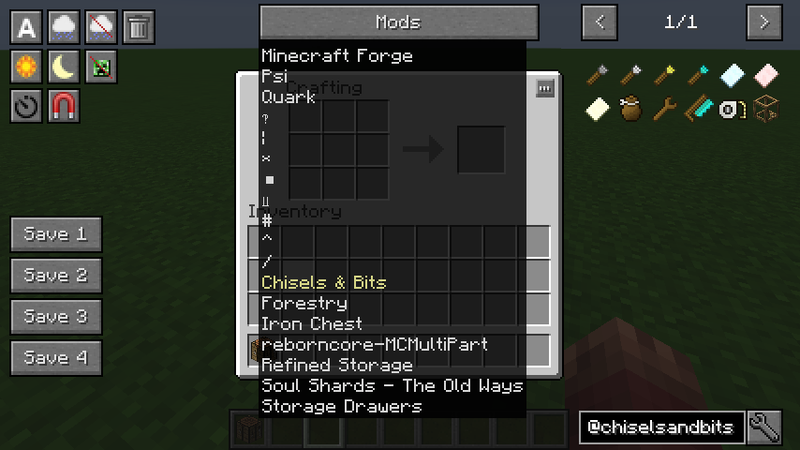 Is there any way to have the "Allow Cheats" rule in survival world creation to override the buttons from appearing? Or at least disable their actions? I know I can disable them manually but that sort of defeats the point. Something about making a lot of progress in survival, then accidentally switching to creative mode kind of ruined it for me. It threw me off because this was how NEI worked in the past. 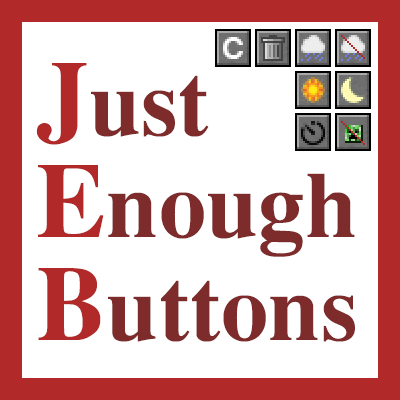 Go to the config GUI of JEB, then click on "custombuttons" and at the bottom there's an option that says "useCheats" when it' set to true JEB will require "Allow Cheats" to be set to true for all buttons. I don't know how that option ended up in the custombuttons category, but it does what you want. The buttons won't be hidden (which you can do by presseing CTRL + H), but you can't accidentally use them anymore. *Is there a keybind that removes/toggles the "JEB" or is it just me? I'm not sure if you are aware, and I'm unsure whether it has to do with the modpack I'm using, but whenever I try to use the kill entities button, my game crashes. 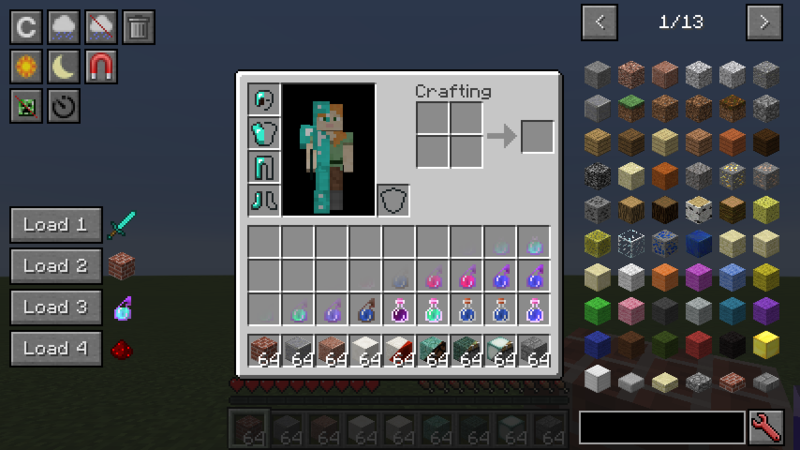 I don't know if it was intentional or not, but your custom buttons work with the new functions feature of 1.12!! Bravo. I say to that.... bring on the custom buttons. lol. Thanks for everything you do for the community. Uhh function commands? I haven't played Minecraft actively in a while so I don't know what you mean but if it already works that's cool. Thanks for the feedback! Lol, neither have I, until now, and am amazed at all of the changes. I started on 1.7.10 and never looked at new content. As of 1.12 your world save files now come with /data/functions and /data/advancements. They replaced Achievements with Advancements. You can create a text file and change the extension to .mcfunction and place them in the functions folder. They are capable of running any vanilla command from this .mcfunction document, and run them all in ONE TICK. Advancements work similarly. With your mod I can make a custom button and have it run said functions. Say goodbye to command blocks and the repetitious entering of commands. Check them out! And thank you everything you do for the community. "[main/INFO] [STDOUT/]: [de.universallp.justenoughbuttons.client.ClientProxy:getGuiTop:110]: TOP 37"
over the time the logfile is getting real big, could you fix that, please. That was debug code for when I updated to 1.12, I accidentally left that in.